Sauce on Sundays is a tradition my mom carried on from her childhood into ours. Now sauce, for those who don't know is an all encompassing term. There was the star of the show, the big pot of sauce, and that sauce is always accompanied by meatballs, sausage, pasta and of course, bread. The simplicity of that meal is dear to me, and as far as family and food traditions go, one of my favorites. A couple of Sunday mornings ago Robert had the New York Times pulled up on his iPad. It's kind of weird to say that out loud. It lacks the romance of imagining he was sitting reading the New York Times in print, but at least that Sunday morning ritual is alive and well for him, just in a different form. He came across this article talking about the signature meatballs at Rao's. He showed me the photo and said, I think it's a good day to make meatballs. Not sauce, meatballs. It took me a minute. We're just going to make... just the meatballs? He said "yeah, but we're gonna make them really big!" My mom came to visit us this weekend and I showed her how we made them. She laughed and said "this is a thing now right? I've seen this on a few menus at home lately." It took her a minute, just like me to comprehend just having the meatballs. Now, I think I'm hooked. We prepared them the same way my mom does, compensating for the size of course. I'm also used to them finishing cooking in the big pot of sauce, which was significantly smaller this time. Changing the process of something you've been making the same way for so long was quite liberating. But don't worry family, my love of the classic is not going anywhere! It just has a new sidekick. Preheat oven to 350°. In a large bowl, combine all ingredients and mix gently, taking care not to over-mix. Heat olive oil in a large skillet over medium high heat. Form mixture into six large meatballs. Sear meatballs, 2 minutes on each side. Transfer to a sheet pan and bake for 20 minutes, or until a thermometer reads 160° when inserted into the center of the meatball. In a large saucepan or dutch oven over medium heat, warm olive oil. Saute onions until translucent, about 5 minutes. Add garlic and continue to cook, about 1 minute. Add tomato paste and cook until carmalized and browned slightly, about 3 minutes more. Deglaze pan with 1/4 cup of water, taking care to scrape up browned bits. Add tomatoes, red pepper, oregano, basil, salt and pepper. Bring to a low boil and reduce to a simmer. Simmer, partially covered for about 25 minutes. 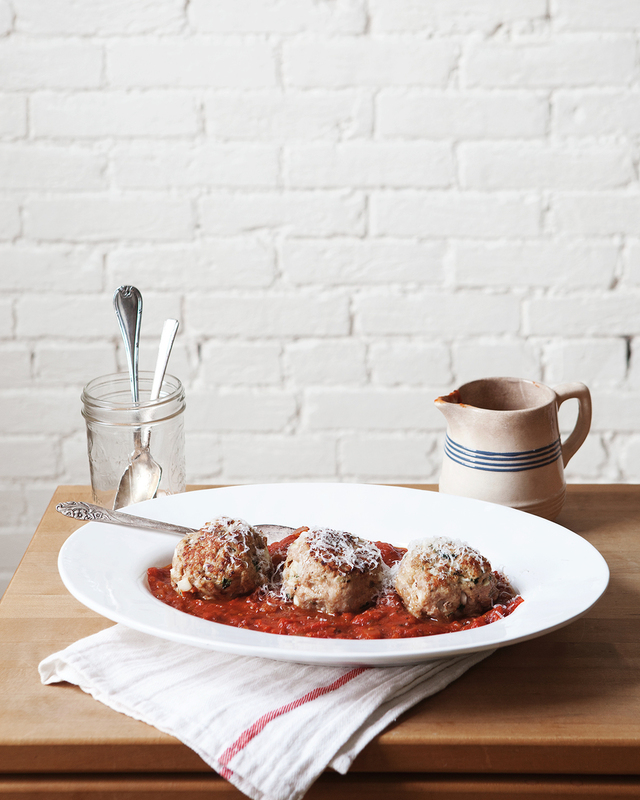 To serve, spoon sauce into dish, add meatballs and top with parmesan cheese.